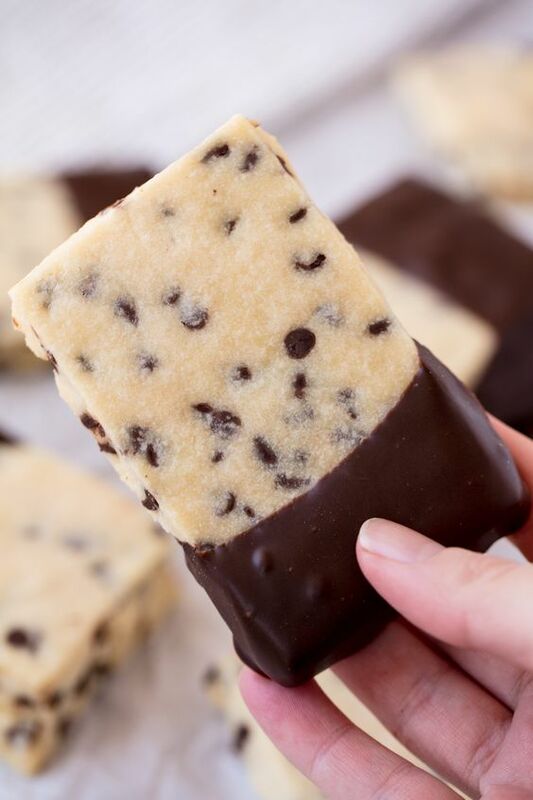 Chocolate Chip Shortbread Cookies are all the goodness of melt-in-your-mouth shortbread combined with a little bit of chocolate. Your family will love these easy tasty cookies! These cookies look so fancy and impressive, but guess what? They only require a handful of ingredients and are super easy to make. You’ve got to love that! On top of all that, they are also super tasty. These are great for a tea party, baby shower, brunch, or just for a regular old treat. These cookies hold their shape which means you can cut them in squares or rectangles as shown, or you can use cookie cutters to come up with your own shape. Smaller cookie cutters may require a slightly shorter cooking time so be sure to watch them closely. Watch the video below for a demonstration of this recipe. I have my own cooking show on YouTube where I walk you through all of my recipes. There’s hundreds of them already on my channel so feel free to binge watch! In a large mixing bowl, use a hand mixer to beat together butter and powdered sugar until light and fluffy. Add in vanilla extract and beat until combined. Add in flour and mix just until flour disappears. 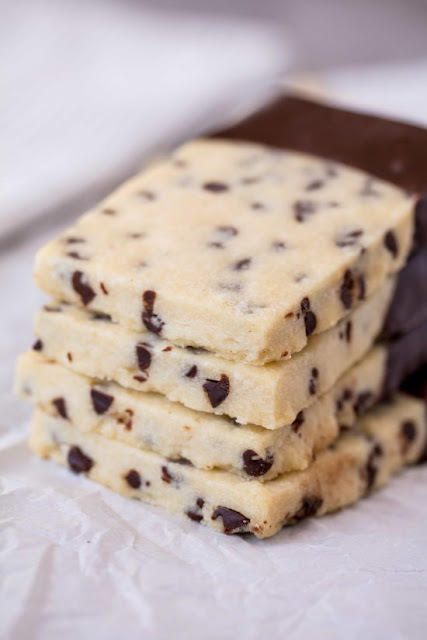 Fold in mini chocolate chips. Transfer dough to a gallon-sized resealable plastic bag, or place between two layers of plastic wrap. Roll until ¼ inch thick. Refrigerate on a flat surface until firm, about 1 to 2 hours. Remove dough from plastic and use a butter knife to cut into equal-sized squares or rectangles. Transfer cut pieces to a parchment lined baking sheet. Bake at 325 degrees for 18-20 minutes, until edges are just lightly kissed with brown. Melt dipping chocolate in a small microwave safe bowl by microwaving on high for 30 seconds at a time, stirring between. Dip cookies in chocolate covering ⅓ or ½ of the cookie and transfer to parchment paper to harden.